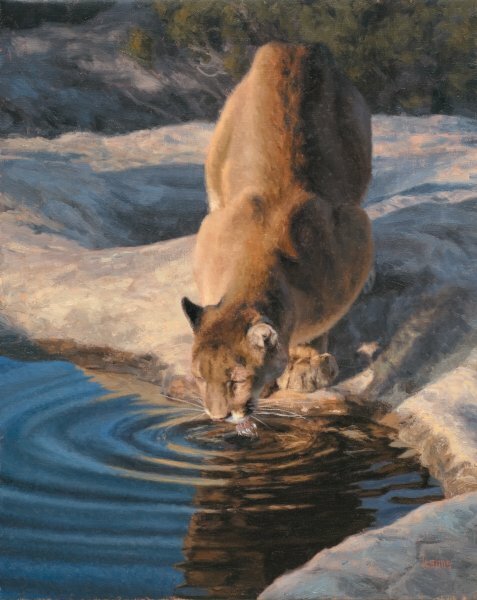 "What inspired me to paint this scene was the feeling of contentment on the cougar’s face and the overall warm glow accented by the softness of the ripples trailing away from the cougar’s tongue. I have been there before and remember how good water can taste, be it from a challenging hike in the Wind River Mountains or having one’s water purifier freeze up at night before the last day of a winter backpacking trip. But this cougar has enjoyed a very warm day and is soaking up some of mother earth’s nourishments before disappearing into the evening’s activities." The talented Sims credits his parents and his wife, Joylene, and their encouragement and total support of his work for his success. His parents recognized his talent and encouraged him through art lessons, while also taking Sims to art galleries where he was able to view works by some of the best wildlife painters in the country. His wife, Joylene, is Sims’ biggest fan and very much admires and supports the artist’s dedication to his painting. Sims is a Signature Member of the Society of Animal Artists; he also participates in several prestigious venues such as the annual Masters of the American West at the Autry National Center, the Prix de West at the National Cowboy and Western Heritage Museum, and at the National Museum of Wildlife Art’s Western Visions Show. Sims’ works hang in many private collections throughout America. He is exclusively represented by Trailside Galleries in Wyoming and Arizona.